We were approached by a popular restaurant chain with multiple outlets located in the US as well as UK. The client was currently encountering regular problems with their current CCTV monitoring services. Therefore, they were on the lookout for a more competent service provider for real-time CCTV monitoring of all their property premises. All of the above targets were achieved within a month's time. Apart from just meeting the basic requirements of the customer, we also resolved several other product and performance related issues that the customer was facing. At the close of the project, our winning solution was able to significantly augment the company's overall level of productivity. At Outsource2india, our CCTV monitoring services drastically improve the security of your premises; ensuring any and all causes for an alarm are instantly identified. Our team of experts can successfully resolve any problems that you might be facing and provide you with a superior solution that will not only enable you to minimize cost, but will also increase your productivity and profitability level. 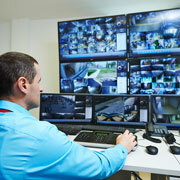 Get in touch with us right now to outsource cost-effective CCTV monitoring services.